There is a tradition at Rosh Hashanah to eat symbolic foods (simanim) meant to help ensure a good new year. This list blends both Ashkenazic (Eastern European) and Sephardic (Mediterranean) traditions and includes recipe suggestions for integrating symbolic foods throughout your yom tov (holiday) menus. Another option is to incorporate lots of simanim into a single dish -- think salads, grain pilafs, or sweet stews called tzimmes. How better to wish for a Shana Tova U'Metukah -- a good and sweet new year -- than to eat one of nature's sweetest foods? For Ashkenazim in particular, apples are the iconic accompaniment to honey. 100% pure honey, without added flavors or additives, is kosher even if the package does not have a hechsher. While added flavorings present a kashrut (kosher) issue, the naturally occurring flavor and color variations imparted by individual flower nectars are totally fine. In honor of the holiday, seek out a special varietal honey. Better yet, offer a tasting flight of several intriguing kinds of honey. The rimon, or pomegranate, is special for many reasons. It is one of the Seven Species of Israel and has traditionally been used as a "new fruit" for the Shehechiyanu blessing (celebrating new and unusual experiences) on Rosh Hashanah. There's another link between pomegranates and the Jewish New Year -- just as the fruits are full of seeds, we hope we'll be similarly full of merits in the coming year. Gezer, the Hebrew word for carrot, sounds very much like g'zar, the Hebrew word for decree. Eating them on Rosh Hashanah is meant to express our desire that G-d will nullify any negative decrees against us. Interestingly, the Yiddish words for "carrots" and "more" -- mern and mer, respectively -- are strikingly similar. So among Yiddish speakers, carrots symbolize the desire for increased blessings in the new year. Please your vegetarian guests with a Moroccan vegetarian carrot and chickpea tagine, and finish the meal with a delicious carrot cake with cream cheese frosting (pareve). The Hebrew word for beets, selek, is similar to the word for "remove." They're eaten to express the hope that our enemies will depart. In Aramaic, the language of the Gemara, silka referred to a leafy green vegetable akin to spinach. Some maintain that this leafy green is the original symbolic food for Rosh Hashanah and that beets are a more recent development. If you'd like to feature beets on your holiday menu try roasted sweet potatoes and beets or Moroccan sweet beet salad. Rubia, which may refer to several different types of small beans, or even fenugreek, is reminiscent of the word yirbu, "to increase." These foods symbolize the hope for a fruitful year filled with merit. Bring some exotic flavors and perhaps good luck to your Rosh Hashanah table with recipes such as Moroccan black-eyed peas (cowpeas), sesame green beans and methi paratha (fenugreek paratha). Including some sort of head on the menu is representative of our hope that we are likened to a head, and not a tail. In other words, we should move forward and make progress in the coming year, rather than follow or linger in the rear. Vegetarians may opt for a head of cabbage or garlic in place of the traditional fish or sheep's head. A simple--and delicious--way to incorporate a head at your table is with roasted garlic (pareve) and rainbow slaw (pareve) including cabbage. If you are ok with a fish head, try porgy baked in salt (pareve), or any other baked whole fish you prefer. For those who are of the more adventurous kind, a steamed sheep's head (meat) will do the trick. The ancient belief that fish don't sleep has been discredited, but the notion that fish are ever vigilant and swim constantly is linked to this symbol and reflects the desire to be constantly aware of G-d and of opportunities to do good. There are so many fish recipes to choose from, but here are a few ideas to get you started. How about lemon-garlic baked salmon, lemon herb baked halibut (parve) or a garlic-flavored baked sea bass? For something a bit exotic, try Indian-spiced salmon. The word for leek is related to the word kareyt, meaning to cut. This symbol is linked to the prayer that those who wish to hurt us will instead be cut off. The Hebrew word for gourd is related to the Hebrew homonyms pronounced k'ra. One word means "to rip," the other "to announce." We ask that the Lord rip up any evil decree against us and that our merits be announced before Him. Fall is the perfect time to serve gourds as they are in peak season. Start the meal with Moroccan pumpkin and chickpea soup. The Hebrew word for dates, t'marim, evokes the word tam, "to end," and the hope that our enemies will be finished. On a more positive note, dates, like pomegranates, are one of the Seven Species of Israel. 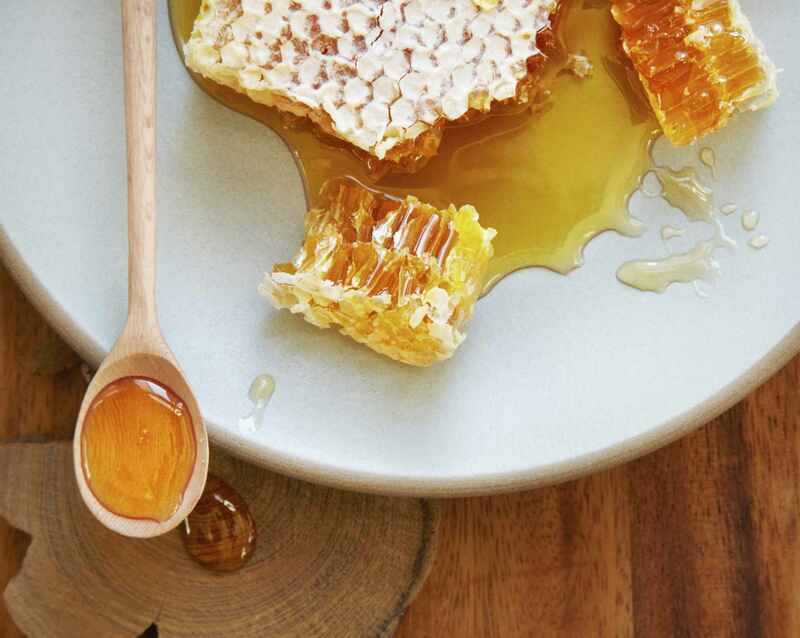 While archaeological evidence now shows that beekeeping was practiced in ancient Israel, it is generally agreed that when Israel is called "a land flowing with milk and honey," the Torah is referring to date honey.